Stoney Creek, Ontario, is a community with much to offer from a rich history and natural attractions to a thriving residential area. A division of the city of Hamilton since 2001, Stoney Creek currently has a population of more than 62,000 and is one of the fastest growing suburbs in the greater Hamilton Area. It was here that the historic battle of Stoney Creek took place during the War of 1812. This event is commemorated annually with the War of 1812 Re-enactment at the Battlefield Park, a national historic site in Stoney Creek. More recently, Stoney Creek is known as the home of the former iconic Stoney Creek Dairy which served frozen treats to people in the region for more than 70 years before closing in 2012. In June 2018, a local retirement home in the same location, opened an ice-cream parlour in honour of the former Stoney Creek Dairy. The city is also well known for the Devil’s Punch Bowl, a 37-metre waterfall on the Niagara Escarpment, featuring an escarpment access hiking trail with connections to parts of the famous Bruce Trail. The Punch Bowl is marked by a 10-metre-high, steel, illuminated cross which overlooks the city. Other natural attractions include the Stoney Creek Waterfront Trail and the Fifty Point Conservation Area along the shore of Lake Ontario. Because of its location on the Niagara Peninsula’s western end, the Stoney Creek area enjoys a temperate climate and local farms and orchards produce a variety of fruit including: apples, peaches, grapes and strawberries. The Strawberry Festival, a 2-day street fair held in Olde Downtown Stoney Creek, features fresh local strawberries and fun attractions including live music and entertainment, horse & carriage rides, food & craft vendors and children’s activities. This annual event takes place in the historic downtown area, where the village of Stoney Creek originated over 220 years ago. Bounded by Centennial Parkway, Highway 8, Gray Road, and Ridge Road; the Olde Town community includes the municipal neighbourhoods of Battlefield and Stoney Creek. 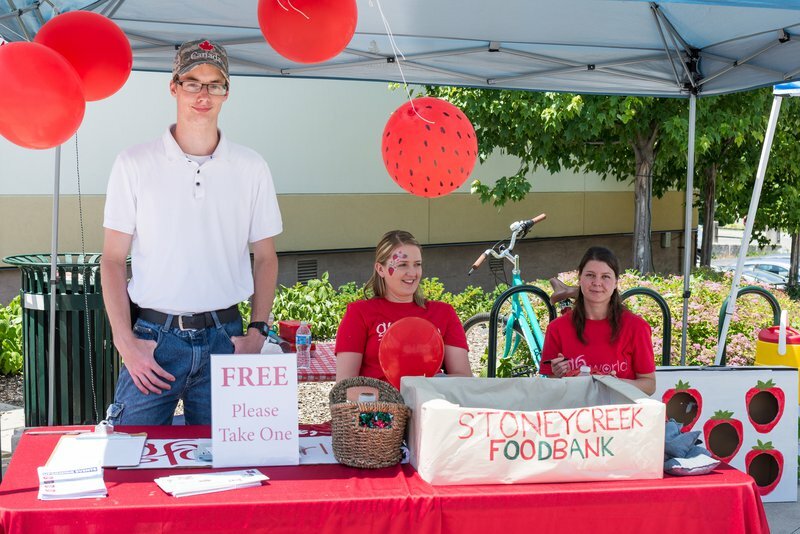 The Strawberry Festival is hosted by the Stoney Creek BIA (Business Improvement Area), an local organization that focuses on creating a healthy and enjoyable business community. Their desire for this event is to help promote community organizations and businesses in the area as well as offering a fun filled weekend to citizens and visitors from the surrounding area. Members of GFA World (formerly Gospel for Asia), in Stoney Creek, were excited to join with their community for this year’s event, held on June 16 & 17th. Their booth was a popular spot for festival goers who stopped by for free children’s activities and strawberry balloons. They also collected food donations for the local Stoney Creek Food Bank. Some of the other sidewalk attractions alongside them included: Cold treats from Sprinkles Ice Cream Parlour, fresh strawberries from Murphy’s Country Produce, a food truck, sidewalk chalk artist, and live musicians. GFA World has been part of the Stoney Creek community since 1984. Currently they have a team of around 30 staff, students, and volunteers serving in their office located at 245 King Street East. The focus of GFA World is to serve communities both in their local neighbourhood and around the world. They do this globally by identifying specific needs and blessing families with items that help them fight the burden of poverty. Investing in these families makes community growth and development possible. 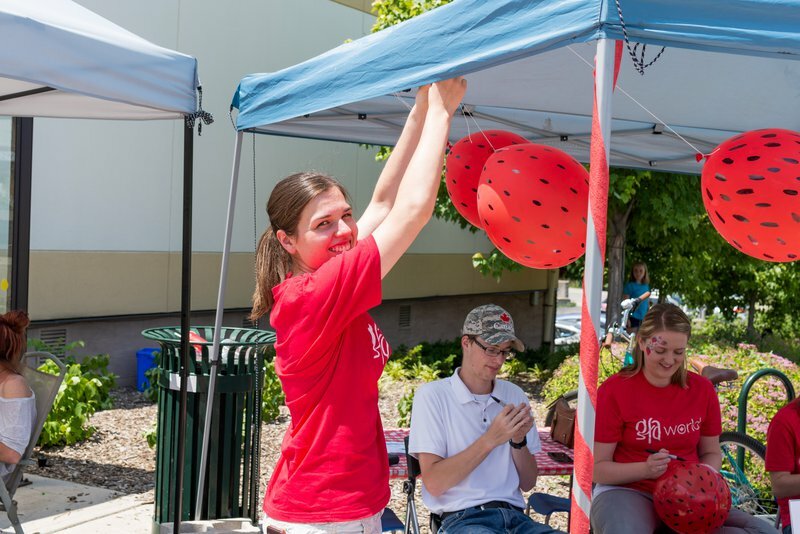 GFA World also serves locally in various ways such as through hosting an annual pancake breakfast, Christmas tree lighting and other community events, participating in the Hamilton Beach Cleanup and other service projects as well as joining in local events. 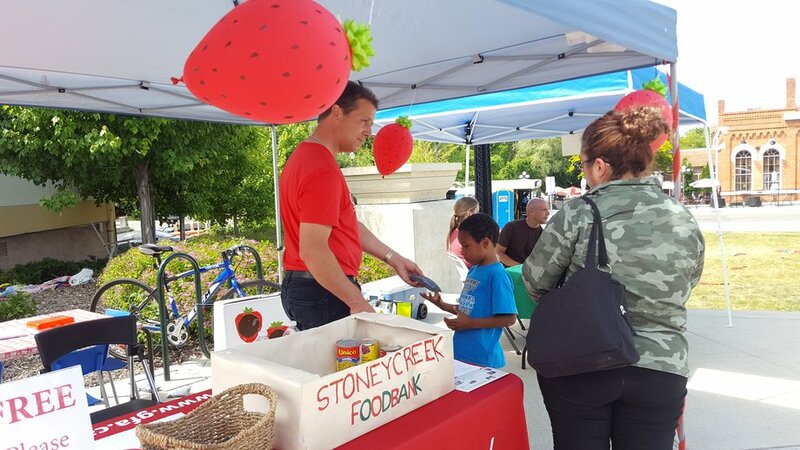 Through being part of the Strawberry Festival, and other community events, they are able to come alongside other like-minded organizations such as the Stoney Creek BIA, who also want to reach out to and meet the needs of the citizens of Stoney Creek.